Momentous history, art and thinking mean that Vienna offers grandeur at just about every turn. There’s plenty to do too: dance waltzes; listen to the Vienna State Opera; tour Schonbrunn Palace; marvel at history in the Kunsthistorisches Museum or in the UNESCO-listed historic centre; and sip coffee in elegant coffee houses, perhaps accompanied by a slice or two of Sacher torte. Eating out in Vienna entails a huge choice from all corners of the Austro-Hungarian Empire, so don’t be surprised if you’re eating Hungarian goulash on one day, and Turkish kebabs or Croatian fish dishes on another. Traditional Austrian food is also popular, chicken or veal schnitzel being a favourite, along with the finest cakes with a coffee. Vegetarians have plenty of choice too in the city’s excellent vegan and vegetarian restaurants. Vienna’s U-Bahn is an efficient subway system of five lines, ideal for getting around the city. If you prefer to move around above the ground, you might prefer to download the Uber app which gets you a cab ride in minutes. Meet up opportunities are plentiful in Vienna. From board games to bike rides and from Buddhist meditation to outdoor fitness, there’s a group to suit all interests. 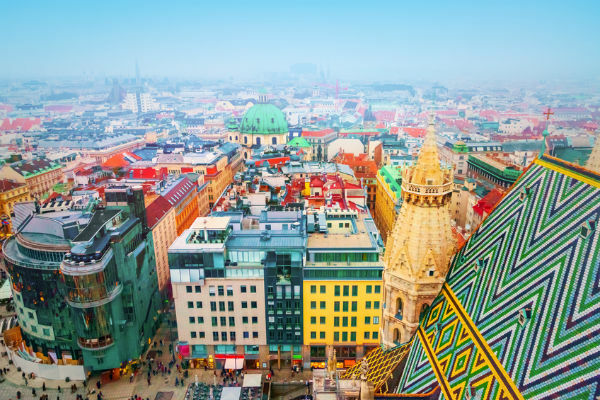 Backpackers enjoy Vienna’s many hostels and low cost accommodation dotted around the city enabling them to discover its many grand palaces, art and culture. Women travelling alone are safe enough on Vienna’s streets as there’s very little street crime to speak of. Gay-friendly Vienna makes it easy to be part of the scene and enjoy the many venues and events taking place throughout the year. Vienna offers the perfect opportunity to escape to the Alps which lie to the west of the city. Covered in vineyards and dense forests, Vienna’s surroundings are rich in natural beauty. No wonder Vienna is so popular for alpine sports such as hiking, cycling, climbing and skiing. Many people liken Prague’s beauty to Paris. With a fascinating history, world-renowned art and architecture, along with live entertainment, dining and arguably the best beer in Europe, Prague is a must. Don’t miss the UNESCO-listed historic centre hosting the famous Charles Bridge, before heading off to the city’s galleries and museums. For everyday life, there’s also an array of contemporary shopping, dining and nightlife to enjoy. For solo travellers, Prague provides meet up opportunities for you to mingle with locals and fellow travellers alike. Prague’s inexpensive and efficient transport system is the most usual way to get around and includes the metro, buses, trams and the funicular railway to the top of Petrín Hill. Get your tickets in advance and stamp them upon boarding your tram or bus, or in the transport area of the metro. For the convenience of a cab right from your door, download the Uber app which gets you a ride in minutes. Eating out in Prague is a diverse affair, with the hearty Czech meat and dumpling-based dishes now being only part of the variety of tastes you will find. From sauerkraut to sushi there’s likely to be a top-class eatery offering you delicious versions. Michelin starred restaurants are plentiful too, as are vegetarian eateries – the choice really is yours! Prague adopts a progressive attitude towards LGBT rights and has been hosting the annual August Prague Pride since 2011. There’s also the autumn multi-city Mezipatra Queer Film Festival that serves as both a showcase and a gathering place for international artists. You will find gay and lesbian bars and clubs dotted around the city; meanwhile, the Vinohrady district is the party area so you will find several great gay venues there. A holiday in Budapest can encompass many things: On the one hand, world-class galleries, classical music and theatre all housed in art-nouveau grandeur. On the other, magnificent mineral water springs and spas, in addition to a vibrant nightlife and fine dining. The city is split by the River Danube into Buda (west-side) and Pest (east-side) and each has a very distinct personality. Pest is livelier and more economical with a greater choice of bars and restaurants than in more historic and exclusive Buda, with its UNESCO-listed castle and quieter pace of life. Once you’ve taken in all the beauty of Budapest, you’ll be ready for a soak as you unwind at one of the city’s magnificent spas which are fed by mineral water from the area’s thermal springs. For an extra-special meal out, you might like to try one of the city’s world-class Michelin-starred restaurants. Vegetarians need not feel excluded as Budapest also boasts several vegan and vegetarian restaurants well worth trying. Whether or not you are travelling solo, you might like to make the most of meet up opportunities to share your Budapest experiences with other people. Getting around Budapest is simple using the city’s efficient metro system. Alternatively, for a little more convenience and comfort, the Uber app gets you a cab ride in minutes. Budapest is a gay-tolerant city; however, discretion is advised because not everyone has evolved as quickly as the laws of the country. Budapest Pride takes place in June, so you might like to add to the fun by combining your trip with the event. Year-round, there are plenty of gay-friendly places to go to eat, drink and party with like-minded others in Budapest. The city of Krakow is the heart of Poland, famous for its stunning architecture and famous museums, Krakow is one of the best preserved old cities in Europe with its historic centre included in the list of UNESCO-listed World Heritage Sites. Other must see sites of Krakow include; the Barbican, the showpiece of the Krakow’s medieval defences, the 19th Century Polish Art Museum and the Cathedral Museum – opened to the public in 1978, it features an abundance of religious items dating back to the 13th Century. The public transport in Krakow mainly consists of bus and tramline services, using the Krakow Tourist Card will allow you to access unlimited travel on trams and buses day and night, including free entry to over 40 Krakow Museums. Taxis are an alternate means of transport with local taxis situated all around the city, using the Uber App is also a good option. Krakow’s food scene has a well-deserved spot on the gastronomic map – from retro restaurants in the old town to fine dining and more modern fare in the jewish Kazimierz quarter, you’re sure to find something to suit your pallet. Vegan and Vegetarian restaurants are also plentiful throughout the city. Krakow hosts many events and festivals throughout the year which are worth attending if your visit happens to fall on one of the same days. Some of the larger scale events include; Krakow Theatrical Reminiscences, Juwenalia, Krakow Film Festival, New Music Festival and the Summer Jazz Festival. Ljubljana is an elegant and historical city offering beautiful architecture and many worthwhile museums including; Metelkova and the museum of modern art – one of Slovenias finest galleries, The International Centre of Graphic Art – holding magnificent modernist prints and art pieces, The City museum Ljubljana – situated in the stunning Auersperg Palace and the National museum of Slovenia. Ljubljana’s public transport consists of city buses which operate every 5 – 15 minutes and cover the majority of the city and its main sites. Kavalir is an LPP run transport service, that can pick you up and drop you off anywhere in the pedestrianised Old Town free of charge. Meetups offer an alternative for solo travellers, encouraging people to explore together and mix with different groups in the area. There’s plenty to see in Ljubljana with much of the city’s social calendar revolving around Prešeren Square, situated between the city centre and the Old Town. During the summertime there’s usually an open-air event or festivity taking place. Ljubljana Castle looms impressively over the city and offers a brilliant exhibition on Slovenian history. To get there, you can jump on the tourist train from Prešernov Trg or the funicular from Krekov Trg. Alternatively, climb for 20 minutes along the path and take in the fantastic views along the way. When it comes to dining options, Ljubljana offers plenty of casual eateries and a few fine dining experiences. The city currently hosts a Michelin Starred restaurant – JB Restaurant, where you can experience exquisite dining. Vegans and vegetarians are also catered for in numerous restaurants around the city. Ljubljana offers some great annual events, the Ljubljana Summer Festival takes place between July and August and stages performers from around the world. The famous international film festival, is one of the biggest events of its kind in Slovenia, it features over 100 films and usually takes place in November. The city also holds one of Europe’s great festive markets, famed for its stunningly designed light displays. Bratislava is a festive city with grand buildings, a rural atmosphere and an old town brimming with shops, cafes, pubs, restaurants, museums and churches. Bratislava is the only capital city in the world which boarders two independent countries – Austria to the west and Hungary to the south. If you venture to the boarder of Austria, to a small town called Devin you’ll get to experience the impressive ruins of the historic castle Devin which also serve as a museum with several excellent exhibitions. Other main sites in Bratislava worth a visit include St. Martin’s Cathedral, Michaels Gate museum, Slavin monument and Grassalkovich Palace. Public transport in Bratislava consists of trams and buses, there are currently 8 tram lines and 152 tram stops over the city. The Uber App is also a great way to get around. Eating out in Bratislava is a pleasure, with the city offering a vast range of options from simple and traditional to elaborate high class dining experiences. The city also caters for vegans and vegetarians with a vast range of restaurants available. Besides Bratislava’s gay bars and clubs, including; Apollon club and Teplaren Café, the city also hosts the famous Rainbow Pride event. Other annual events worth a visit in Bratislava are the Wine Festival, Easter market, Junifest and the Christmas market. Females travelling alone should not encounter any problems, however, a popular option to explore the city when alone is through Meetups, enabling yourself to sightsee with others and meet local groups.